Have you ever been cooking something on the stove and walked away for just a second only to return several minutes later to a completely burned pan? Well, I have. I get easily distracted as dinner time can be pretty hectic around here with a busy toddler running around. I have burned more than my fair share of pans. 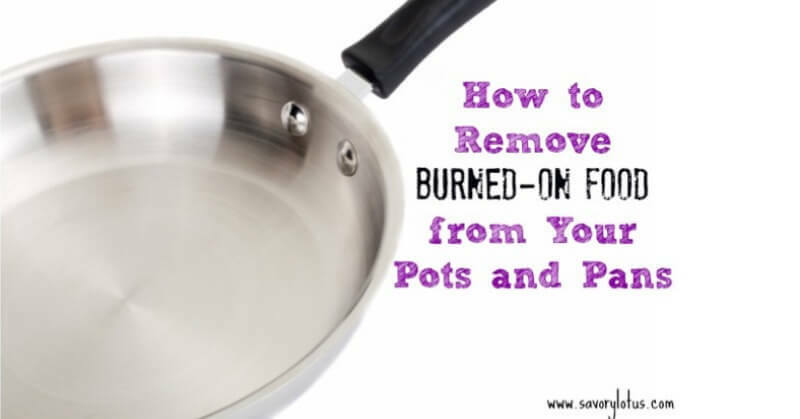 Today I am going to share with you a super easy way to remove burned-on food from pots and pans – that charred, black, cooked-on food from the bottom of your stainless steel or enamel pots and pans. No more scrubbing and scrapping. All you need for this method is water and some baking soda . That’s it. I learned this trick from a friend whose house burned down, and her husband used it to salvage her expensive All-Clad stainless cooking set . I was blown away how amazing they looked after he cleaned them up. Fill the pot or pan with about 2-3 inches of water. Add 1/4 cup of baking soda. Bring to a boil and allow to simmer rapidly for 15 minutes. Turn off heat and allow to cool for a half hour. After a half hour, wash the pot or pan as usual, gently scrubbing. The burnt-on food should come off easily. I find that using a plastic pan scraper makes this job much easier and doesn’t scratch the bottom of the pan. If the burnt residue is stubborn, simply repeat the process. You can add a 1/4 cup of vinegar for extra serious jobs. This technique is for stainless steel and enamel pots and pans only. I cannot recommend this technique for non-stick cookware. And using this on cast iron would require you to re-season the pan afterwards. ALWAYS set a timer when you are cooking, even if you think you will remember to turn it off. It has saved me many times. Like household tips? Check out my 5 Tips for Removing Laundry Stains Naturally. I like to use a fresh dryer sheet in whatever type pan fill pan w/water & place dryer sheet into your pan ~ sets over nite & wala – it’s gone, cleans it perfectly!! My long time experience. It doesn’t eat away at it…it more likely greases it off. That didn’t work for me, for some reason. I followed your directions. Stainless steel pan. I cooked spam in it and sprayed a little Pam cooking spray and even though i didn’t let it burn, what was in the pan is almost impossible to remove, fully. Sorry, I hope the comment shows up in the correct spot, I was reffering to the dryer sheet left overnight in pan with water, not working for me. This is great! I will definitely try the next time I accidentally burn a pan. Thank you for sharing. I can’t thank you enough! Your advice saved my pan and it looks fantastic once again. Not only did I turn the fire on high with two cups of brown rice and no water but when I threw the burnt rice in the trash, I touched the side of the pan with the plastic bag liner. This was really a mess but I followed your instructions and after ten plus procedures, the pan was shinning once again! It took time but it was well worth the effort. Thank you again! Hi, Peggy! The first thing I would do is to saok it in very hot soapy water. After is has soaked and cooled, scrape out as much of the gunk as you can. Then I would try the method above. Fill pots 1/3 full with water, bring to a boil, add baking soda, and let simmer. You may need to repeat the process if the pan is really bad. Let me know how it goes. Thanks for coming by. I did this and I had three pans. Two are ceramic coated and the other is coated differently – Green Pan. The Green pan was the easiest to do and I was able to use your method on this pan and I didn’t have to wait the 30 min. for it to cool down to get all the gunk off. Whenever we make Colombian Bistec the pans always burn. It’s just how the food is cooked and it’s delicious, but the burned pans are awful. Usually just heating up vinegar works, but the last couple times it didn’t get everything off. So I tried your method to fill the pans with some water, adding baking soda and I also added white distilled vinegar, boiled it and then reduced the heat to medium to keep it boiling for 15 minutes. Afterwards, I scraped the Green pan and one of the ceramic coated pans with a wooden spatula and I was able to get all the burned stuff off and then wash the pans like normal. Didn’t scratch anything. This was still hot so I put some water to it and it totally sizzled. I used the wooden spatula and was able to get the rest of the burnt stuff off, well, maybe about 95%. It was good enough. So, for really stubborn, just the baking soda & vinegar heated and then boiled off, then add some water and scrub with something like a wooden spatula to get the hard burned off stuff off. Vinegar is an acid and Baking soda is a base. They react and neutralize one another quite well as many of you might be familiar with this reaction from middle school volcano projects. So. after they react there should be little to no acid or base either one left over to do any cleaning work. Adding them together shouldn’t work well at all. However I do have a burnt on pan and hadn’t thought of baking soda so will try this and see how it works. scrubbing sponge was able to remove all spots. My inner pan looks brand new again. I have been using the baking soda hack for all my other pans for quite some time now. I heat water to a boil in a pan first, then I take the pan off of the burner and add the baking soda to the boiled water – in the pan. I leave for awhile and come back and gently scrub. Burned residue all gone ! This works! I am so thankful you shared this tip. It saved my expensive stainless steel sauce pan after I accidentally left the burner on after removing the food! What a mess. But now it’s like new again. Thanks again!! Yay! I’ve burned my fair share of pans as well. This trick has worked wonders! Thanks for coming by! thank you, this worked wonders!! i burned the strawberry jam i made to the bottom of a pot and had scrubbed enough scorch off of pans to know soaking wasnt gonna help…. found this and omg…. ill go straight for the baking soda everytime from now on!!! YAY! I’m glad that it worked for you. I’ve had to use it myself several times. How to remove burned on marshmellows from a stainless steel pan ?? Just did this on a ceramic pot and the chrome burner pan that had been left about 30 minutes. Total disaster. Cleaned the pot with no residue and put the burner pan in a dutch oven using the same process. It came out looking nearly new. If I hadn’t done it myself, I probably wouldn’t have believed it. Tried this. Marginal success. Unfortunately the water simmering with the baking soda produce a mist as if the baking soda was reconstituting which resulted in the entire kitchen being covered in a white powder. Made an incredible mess on the marble and an even worse mess on the stainless steel. Took another two hours to clean the kitchen. Bummer! Sounds like maybe you had your pot a little too full of water and bubbling a little too fast. Sorry to hear that. – If it starts to raise to the top take the Pot off the Stove then back to the stove when you lower the heat to where the foam is steady level and not bubbling outside of the Pot or you will have a mees to clean along with the Pot. ALL DONE! 100% Works! I did it twice because it was alot of build up and I tried everything for over a week to get it clean. Should have looked this up sooner. I am a sceptic abaout alot of what they say about something on the internet but this I can say WORKS! Thank You for the advice. I hope my comment helps anyone that runs into this issue. I do home canning and had some wonderful peaches which I froze with no problem. I had the bright idea to boil the left over juice, which I added pectin and sugar. You can guess what happened next, I forgot it and burnt it so bad I had to dig out the almost solidifed jam and had a badly burnt bottom. First I boiled it with plain water with only a quarter size peek of the bottom, then I found your Web site. Results so far after using the baking soda and vinegar is now I can see 90% of my bottom. I am now doing the same procedure again. I need my pot today because I have tomatoes and pinata sauce to can and need both of my big pots. Second time did 9%. I expect the 3rd time to do the rest. Awesome post. Method works. Will start the tomatoes after the 3rd time and a good wash. Thank you. If you use the baking soda & vinegar, please be sure to put a lid on your pan! I did not & ended up with a baking soda mess in my microwave over the stove … lots of baking soda residue in the vent grills & on the front of the microvave! Note: I boiled rather than simmered, which may have been the reason! I’ve seen the dryer sheet method on several sites promoting this for busy mothers with small children, but there are so many chemicals in dryer sheets (which I haven’t used for nearly 30 years) I don’t think I’d use them to clean a pot or pan. The baking soda/vinegar/heat method seems to work quite well, and there’s always Bon Ami as a back-up. The site below lists the seven most common toxics found in dryer sheets. Thank you so much for the tip. It saved two of my very expansive Le Creuset! Katja, your reccomendations worked for me! I tried a few things before your remedy of baking soda, plus the vinegar, rapidly simmering for 15 minutes, then cooling, then washing the pan. I used the vinegar because I’d tried so hard to get these stains out previously. Thanks, you’re a lifesaver….I’m staying in someone else’s house and somehow, even standing there cooking the whole time, not walking away, I made such a mess in that pan! They’re very partiuclar about their cookware. Thanks again! Baking soda, with or without vinegar, is simply being used here as a mildly abrasive pumice. For all our cookware (stainless steel, some ceramic-lined, Pyrex/Anchor Hocking glass and one ancient iron griddle), my husband and I use clean, dried eggshells, instead. 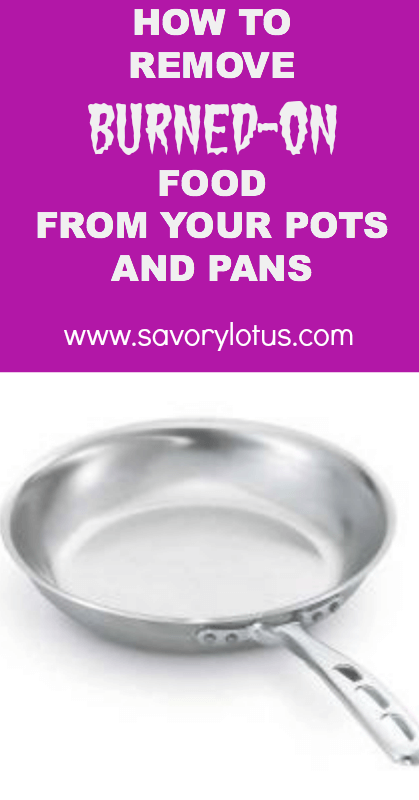 We simply add just enough tapwater to cover the bottom of the cool, soiled pan, drop a clean, dried eggshell or two into it, and rub it around the pan bottom until all char and food debris is loosened and can then be rinsed away. As the shell breaks into ever smaller pieces, its irregular edges act as tiny scrapers for any stuck-on food debris, and being elemental calcium, it will not hurt your fingers, nor scratch, bind or otherwise harm any surface to which it’s applied. To clean spent eggshells, simply wash them under cool, running water, using your fingertips to gently rub away any remaining egg membrane. (You’ll be able to feel when they’re clean: their insides will feel just like their outsides.) To dry them, drain out any standing water, then simply refrigerate them uncovered in a bowl overnight. Clean, dried eggshells can be stored covered and chilled indefinitely. Worked for me! My pan looks like new! Tried many suggestions, but none worked like this one! My pan now looks like I just bought it and it is almost thirty years old…..that’s All Clad for you. Best purchase I ever made! Once you clean it, the pan returns to it’s normal state. The way to get food to not stick is not to burn it or not use too high of heat. Hope that helps! I was making rice krispies treats and when I mixed in the rice krispies I burnt it and the pot too, I was afraid I had ruined the pot and if I tried to scrap it off it would scratch the pot, so I googled it and chose the first link, It worked amazingly I barely had to scrub, and the pot was cleaner than when I found it, THIS IS AMAZING!!!! To be honest it was a wasted of my time. Tried it and I still can’t get the burnt food off any easier. Sorry to hear that.What a bummer.This little trick has worked for me so many times. And for countless others who have tried it. What I’ve done is to get a large pot of water boiling and add the baking soda. I’ve then put the item/casserole pan into that water. It sticks out of pan, and you have to flip it around a few times to cover the entire surface. Hope that helps. This worked wonders !! Thank you so much, saved my life and my pan. This 1000% works!! Absolutely desecrated a pan at my mother in laws house and thought I’d have to buy a new pan! Tried this, takes some elbow grease but it’s cleaner than ever! I recently cooked tapioca pudding in a favourite pyrex glass saucepan, and it got burnt-on black horrible stuff on the bottom. Regular dishwashing & scraping didn’t do much to remove the stuff. I though I’d ruined my favourite pot,but I found your info, which I followed (water & baking soda). It worked like a charm! I’ve bookmarked your site (just in case I get crazy and want to make tapioca pudding again)! Thank You so much! THANK YOU – You saved my favorite pot. It’s nothing expensive just a cheap Ikea pot – but it’s the best pot that I have. I was dreading getting lost in the maze of Ikea again. I stupidly complety forgot about a pasta sauce I was makeing – tried saoking, scrubbing with, Barkeepers friend, boiling with vinegar – this was the only thing that worked!!! Yay! I totally know that feeling. I simply put COLD water into a burnt pan with baking soda and leave over night. (Especially for any type of protein–eggs, for instance–because low heat will not cause proteins to stick. I keep trying to convince my husband to use low heat (more healthful, first of all))—His cooking pans always need long soaking; mine generally don’t have anything stuck on them. LOW HEAT is the trick! Sometimes, the next day after scraping off the softened burnt or stuck gunk I might need to do it again with cold water, baking soda, and add white vinegar.. I also have found that stains (like from turmeric) come off dishes easily with a paste of baking soda. Ditto for stained coffee and tea cups, tomato sauce stains–also can add the vinegar. Now I use mostly baking soda as my basic (by hand) dish washing formula. Some people claim baking soda and/or vinegar in dishwasher will get rid of mold in dishwashers…did not work for me and now I don’t use a dishwasher, anyway. For extra sparkle and/or sanitizing, dishes/pots and pans you can add vinegar to hot water rinse. The baking soda also cleans stains out of stainless steel sinks, toilet bowls, shower stalls, and sanitizes garbage cans. And vinegar is great for spraying on cutting boards and counter tops/ stove tops to remove stain and to sanitize. (lemon juice also works) Vinegar is great for soaking combs and hair brushes. I use white vinegar and hot water for scrubbing wood floors, too. I have been working through numerous bags of beef fat, rendering tallow. .. up until this last batch I was doing well keeping the pot clean, but this last batch had a bit more meat debris in it and the chitlins burned to the bottom of the pan and I could not scrape them off to save my life. I did not expect this method to work but sure enough, about 3 inches of water, about 1/4 cup soda, and 1/4 cup white vinegar did the trick! I was flabbergasted at how well it worked! I boiled about 5 minutes (careful it doesn’t foam over) and let it sit a few minutes as the foam dissipated, and it was 90%removed! The rest I was able to scrape away easily with a spatula. It saved my pot and I’m moving on to another batch! This is an extremely handy trick to know, thank you! !